We have recently had some positive signs that the state is getting more serious and aggressive on aquatic invasive species (AIS) prevention. The Minnesota Department of Natural Resources has announced it will be requiring roadside AIS inspections and they will be issuing more citations for violations and requiring decontamination. In addition, the legislature has been presented with a proposal to create an invasive species research center at the University of Minnesota. This news was publically celebrated by a number of key legislators. Until now, Minnesota’s AIS strategy has been incomplete, piecemeal and well, reliant on wishful thinking. In short, we have lacked a plan and strategy. For too long, we have hoped and many probably believed, that Minnesotans were well aware of and take appropriate voluntary protection actions so that the spread of AIS would be minimal. Those of us who observe boater behavior knew otherwise. The state reports that last year 18% of boaters stopped had violated AIS laws! I suppose it is not productive to wonder, if these actions had been in place earlier, would Lake Minnetonka now be free of zebra mussels? But it is productive and appropriate to ask whether these new initiatives will be enough to protect Lake Minnetonka from additional AIS. As encouraging as these developments are, we have a ways to go. The research institute must still be funded. Calling for Legacy monies is obvious, but so far, these have not been forthcoming for AIS prevention. The roadside checks and fines are appropriate, but the ‘small print’ indicates that these will be moderated so as not to unduly cause traffic congestion. And what about protecting Lake Minnetonka? 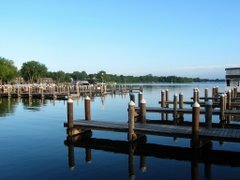 In addition to the proposed statewide efforts, we need protections on Lake Minnetonka. For 2012, the level of protection around Lake Minnetonka will be the same as it has been – and at that level, zebra mussels got in. It is time to consider access controls akin to those to be in place on Christmas Lake. A recent Star-Tribune editorial (January 10, 2010) ends, “With a timely bipartisan push, Minnesota can bring a new sense of urgency to the invasive-species battle before it's a lost cause.” We agree, although we would argue the sense of urgency is not new, rather the sense of recognition that AIS are ruining our lakes is. We need an AIS plan and strategy. Minnesota’s stated objective is to ‘slow the spread’ of AIS, which is meaningless in a management context. A true plan and strategy would state a measureable and actionable objective and identify the real needs. Lacking a plan with measurable objectives, we have been confusing doing something (doing anything) with doing what is needed. Last April, I recall MN DNR Commissioner Landwehr telling the Minnesota Waters’ conference attendees, “We will never absolutely stop the spread of AIS, but if in ten years only ten more lakes have zebra mussels, I will consider that a success.” In 2011, zebra mussels were discovered in eight new lakes. We have a ways to go. We applaud the new enthusiasm and initiatives and urge our leaders to follow through with adequate funding and priorities. We encourage our leaders to take real, strategic actions to protect our lakes from AIS, because more lakes are at risk of being invaded by more species. I have have read your comments with interest for years, and I take great umbrage over many of the things you have said over the while having a forum available to you in the opinion column at the Lakeshore Weekly. I have not challenged you in the paper only because I am in agreement that invasive species must be battled on all fronts. I do however, take issue with your arguments about LMA members paying enough and referring to them as the "elite stewards of the lake" such commentary has most of us laughing as we roll on the floor. In fact it is lakeshore owners who are the greatest threat to Lake Minnetonka, and to say otherwise, would make any serious and educated person, of which I am one, question your academic credentials in biology. You also dissed the very sound practice of riparian buffers when the DNR proposed them for the lake by suggesting that LMA members shouldn't have to give up their silly lawns. Finally, you have also implied that the rest of us, who are not lakeshore owners do not contribute enough to stopping the spread of AIS. I consider such talk insulting when in the same breath you are not willing to stand up and defend the buffers. As a non lakeshore owner, I care least about the lake being conducive to the toys of the LMA members, or their recreational fun. I would suggest that in the future, LMA members are persuaded to implement behaviors which are backed by sound scientific principles and not their wants. As a biologist, it is your duty to make such arguments to your members ie. riparian buffers. Taking such action would reinforce your credibility with the general public. I am a 7th grade student and I am very interested in protecting Lake Minnetonka from invasive species. I want to know if there is any way to get involved with zebra mussel control. A friend of mine lives on Christmas Lake and has told me about the inspections authorities are performing on boats entering the lake. If you have any suggestions on what I could do to get involved, it would be great if you could post them on this blog! Thanks and protect our lakes!